Only abstracts that has NOT been previously published or presented can be submitted. Abstract submissions can only be made electronically through the congress website during the designated submission period. Please submit your abstract by following the submission procedures. Abstracts submitted by e-mail, mail or fax CANNOT be accepted under any circumstance. The lead author must also be the presenter. You may register up to 10 co-authors including the lead author. You can also register up to 10 affiliations. The Program Committee requires that all presentations be as free of commercial bias as possible and that any information on commercial products or services be based on already generally accepted medical thinking. It is also preferred that generic drug names be used wherever possible and that any presentation referring to unlabeled or research-associated commercial products should disclose this situation to session attendees. Please limit your abstract title to 80 characters. The abstract text limit is approximately 1,400 characters, which excludes the title, names of authors/co-authors, authors’ affiliations, spacing and disclosures. Do not include any figures, tables, charts, photographs or illustrations. Abstract submission is accepted only through online registration. You can access the abstract submission website via Internet Explorer, Fire Fox, Chrome and Safari only. You can revise or delete your abstract any time before the deadline, but please note that any submission, revision, replacement of abstract nor withdrawal are NOT acceptable after the deadline. Once submission is completed, you will automatically receive an e-mail confirming the receipt of your abstract submission. This will be the only notice regarding abstract submission from our end. If you do not receive this e-mail within a day after submission, there is a possibility that your submission has not been processed successfully. If this is the case, please contact the Congress Secretariat (jscc2018@congre.co.jp) immediately for directions, before submission deadline. Please be informed the Congress President will be responsible for making the final decision regarding abstract acceptance, based on the reviewers’ assessments. The submitting author will be notified at the e-mail address provided during submission, whether their abstract has been accepted, along with other details. It is the submitting author’s responsibility to ensure that e-mails from the Secretariat can reach them. 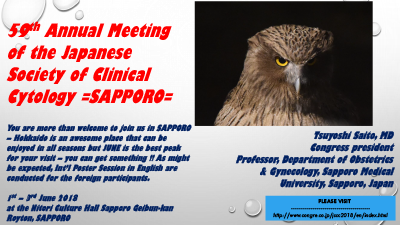 Copyright © The 59th Annual Spring Meeting of the Japanese Society of Clinical Cytology. All Rights Reserved.